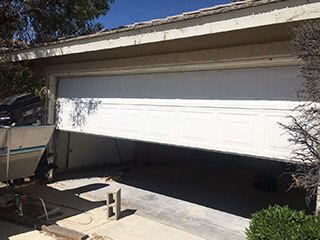 An automatic garage door can make your whole property much more secure. It's also a lot more convenient to be able to push a button on the remote control to generate the closing and opening of your door, rather than to manually lift and lower it. Still, it's important to recognize such a giant automated moving system can also pose a safety risk if not properly set up and looked after. Find out what you need to do in order to protect your family, yourself and any visitors to your property. All garage door openers produced after the beginning of 1993 should come with an inbuilt safety reversal mechanism. This feature works to reverse the door automatically if the door touches an object while closing. We recommend you check this mechanism by testing it on a regular basis - you simply need to put a roll of paper under the door when it is open and push the button again to close it. When it touches the roll, it should be triggered to stop and go back up. Following installation, you'll also have to carry out proper sensor maintenance from time to time, which involves cleaning the units and checking the alignment. During installation, we also recommend ensuring the wall button and wireless garage door keypad are installed at a sufficient height to be inaccessible to small children. Similarly, it is a good idea to keep track of the clicker - you don't want it to be clearly visible to strangers or leave it lying in the path of children who might play with it. If you have kids yourself, it can also be worthwhile explaining the dangers of playing with the door. We recommend all car and garage users in your home receive a detailed run through of how to use the door and opener safely. It's definitely worth consulting with the owner's manual as part of this exercise. Don't hesitate to contact our team at Garage Door Repair Sun City West with any additional questions you might have - we're here to help!